The pineal neuro-hormone Melatonin (MLT) is involved in the regulation and functioning of various processes in the human body. Among other functions it plays a significant role in the transferring of the dark period signal on a daily basis while its levels and duration of its secretion are the basis for seasonality. As a result the suppression of MLT production by LAN exposure affects not only various daily rhythms but also seasonality of our thermoregulatory system being responsible for heat production on the one hand for heat dissipation on the other. The disruption of the MLT production also affects our immune system due to the fact that receptors of this hormone are distributed on white blood cell. Because MLT is an anti-oxidant and anti-oncogenic agent its reduction from exposure to LAN can result in increased breast prostate cancer (BC&PC) risks through a more rapid proliferation of cancerous cells or/and in an indirect way by a mal-functioning of the immune system. As MLT suppression depends not only on light intensity but also on light wavelength with short wavelength illumination being very effective in MLT suppression. 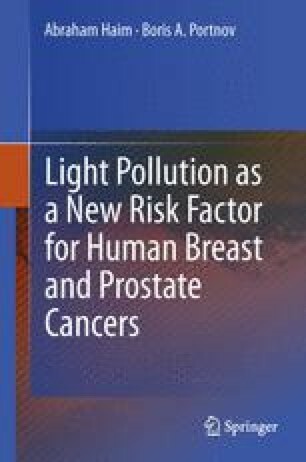 The increase of such illumination worldwide under the “environmentally friendly illumination” paradigm should thus become a concern for health authorities worldwide. No matter how fast light travels, it finds the darkness has always got there first, and is waiting for it.